Other Thoughts: I would recommend this monitor but potential buyers should be aware of the cons I listed. Pros: Large screen; easy to see sitting far back in my office chair. Colors are so vibrant I just browsed the web looking for high color saturated images to be impressed with (honestly, I did for an hour). The screen is glossy which gives it a nice "sleek" look, and also aids in achieving more saturated colors as compared to matte screens, though glossy is not for everyone. I was also worried of getting a 27in monitor for the sake of 1080p looking too stretched and/or pixelated. It can be if you sit close to it, but in my opinion it does a pretty good job on it's own with negating too sharp of pixels to make it seem smooth enough on the eyes. I sit about 2 to 3 feet away from my screen though, and have a quad monitor setup so I'm never in one screen's face all the time. Cons: Like I said it's a glossy screen, and if it weren't for the terrific colors then I would not be using this. My office (ahm, cave...) is mostly dark with some neon lights, so there is little to no glare with how I'm using it. If the main light is on (or if I was somewhere like in a dining room or a real office) then the glare is pretty bad, so bad that I might not of purchased it. Other Thoughts: I would recommend this only if your PC area is dark, so the glare is not as pronounced. I believe there is a 24in version of this monitor. It's too bad there isn't a 25in or else I would have bought that instead. Still happy with this one though. Pros: Easy installation. Picture is amazing, vibrant, sharp. Very thin, extra thin bezel. Sturdy stand. Cons: Exactly side by side they don't quite line up. No DVI input. That standard word that pops up in the upper left corner is annoying. Other Thoughts: Haven't tried the speakers yet. The picture is amazing. I haven't noticed what other reviewers are talking about with the white and black, but I don't have my old one still to compare. They are incredibly reflective, but I needed to get window treatments for my office anyway. I purchased an amazing 3M stand to use with these, but it wasn't compatible with the bridge on an executive desk. If I had been able to use that stand, the tilt and slight difference in the original stands wouldn't be an issue. Know beforehand if you want a reflective screen or even have an office where it is conducive to getting any work done. The picture is so amazing, it offsets all these other items. Pros: This monitor is alright. The colors are really vibrant and it's 27". The addition of speakers is nice and they sound alright, though they don't get used much due to being in a cubicle environment. Being only 1080p at 27" is nice for older employees. Cons: No stand adjustments other than tilt. The screen is extremely glossy and reflective. The HDMI ports aren't very tight and cause the signal to cut out if the cord is bumped. Only 1080p at 27". No DVI port. Only two USB ports. 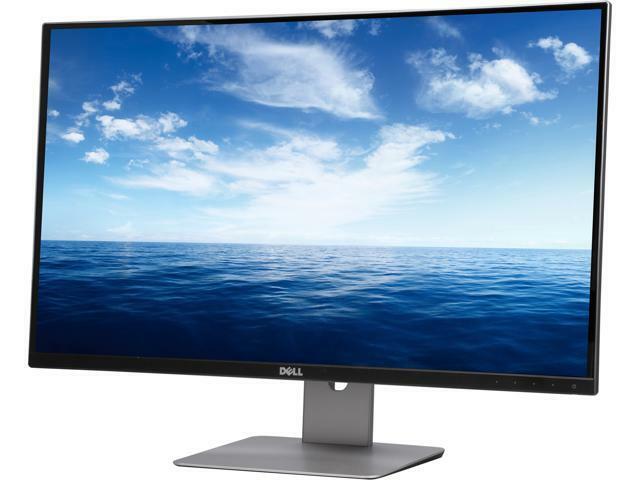 Other Thoughts: If you find this on sale it's an ok deal, but I would recommend Dell's Professional (P) or Ultrasharp (U) series monitors over this one. You get a lot more for your money. Pros: still working on this.... will update when I find pros. Cons: right out of the box- upon setup I am very upset. I bought two of these monitors to use in a dual set. The 27" monitor stands are NOT height adjustable. When I place these monitors side by side they are a full half inch off in height which respect to each other and there is no way to get them level because there is ZERO vertical adjustability. Being a product engineer myself it dumbfounds me that Dell would allow that much variation in their manufacturing process to allow a HALF INCH of tolerance in final assembly when they know dual monitor use is common. It makes me question the quality of Dell products and the quality of the engineers and designers at Dell. Unacceptable. 4 out of 15 people found this review helpful. Did you? Pros: It has no major flaws. Thin bezels. Really the best feature here. Looks pretty good when adjusted. Cons: Glossy. There's no point to this. No one likes glossy, do they? Almost none of their other monitors are glossy. Luckily, I have thick curtains, and ceiling lights. No black desktop backgrounds for me. I don't need another mirror. Mediocre stand. Really, I swapped it out to a 3M adjustable stand immediately. Other Thoughts: Dell's product line makes no sense. I own multiple Dell monitors. Six currently in use. If they are different part numbers, they might as well be from different manufacturers. I think they randomly pick I/O from out of a hat. And backlights from a bin labeled, "emits light". Seriously, none of my monitors have all the industry standard connectors, even the UltraSharp model. And every model needs to adjusted for luminosity. My UltraSharp nearly blinded me with the force of a million suns, the first morning I used it, and this model(S2715H) had to be turned up to nearly 100% brightness. If their monitors have a flaw, it's incongruity. If you want similar monitors, buy the same exact model, and pray to whatever deity you choose. 7 out of 11 people found this review helpful. Did you? Cons: Couldn't produce the color white; at full brightness it looked like a laptop screen when it dims into power saver mode. I typed in the service tag to ask Dell what the?? And noticed something weird about my warranty, it started 6 weeks before I bought it. Then I noticed that was because it shipped on 11/16- I bought it on 12/31. Shipping to a retailer does not begin the life of a monitor. 99.99% sure this was used and they sold it as new. No response from customer service (I mean, this isn't Am****! ), and I wouldn't waste a second on Dell's "customer service". Other Thoughts: You'll probably get a great monitor. Mine couldn't produce white. 10 out of 14 people found this review helpful. Did you? Pros: - No dead pixels. - Nice case with narrow margins. Cons: - Whites appear yellowish, blacks are not very black. No amount of fiddling with monitor controls, Dell Display Manager or Windows 10 Color Calibration controls improved this to my satisfaction. - Glossy screen reflects things behind you. I can see a reflection of myself, especially in dark areas of the screen. - No DVI input (I knew about this when I placed the order, so I ordered a DVI to HDMI converter cable to work with my DVI only video card). - Speakers are typical of those built into monitors - low quality sound. - When launching different apps, this monitor automatically switches its Preset Modes. In the top-left corner of the screen the monitor displays "Multimedia" or "Standard" etc., which are names of its Preset Modes. This is annoying. I'd like it to stay on the Preset Mode I select in the monitor's menu or at least not break my concentration by flashing this irrelevant information on the screen. I would not recommend or purchase this monitor again. I would like to return it but Newegg's return policy apparently would have me loosing about $30 on the transaction. Other Thoughts: I set this up in a dual monitor configuration along side my 3 year old Samsung BX2355 23" monitor. The Samsung's display of white looks white and blacks are blacker than this Dell. I much prefer the old Samsung over this unit.